Weight - Dry: 132.2 Lbs. Weight - Equipped: 155.1 Lbs. For more information from the manufacturer's of the Mikron III - Parma-Technik who are in the Czech Republic, visit the web site:- Mikron III website. It should be noted that the Mikrons illustrated on the website all have a starter ring with starter motor and an alternator at the rear, this version cannot be fitted in the Chilton being to big at the front because of the starter ring. The most basic version the MIKRON III A S without starter or alternator as originally manufactured post-war should be used, enabling a slim cowling line and a useful saving in weight of about 15 lbs. Fuel System: Twin fuel pumps to Hobson carb, min octane 73. Weight - Dry: 141.5 Lbs with 2 magnetos, 2 fuel pumps and airscrew hub. The pre-war Mikron II differs from the post-war Mikron III mainly by the position of the magnetos being on top of the crankcase, whereas on the Mikron III the magnetos are attached vertically below the rear accessory case. The Mikron II does not have a scavenge pump, so the oil tank must be below the level of the engine to enable the oil to drain back in to the tank. The Mikron III has a scavenge pump thus giving more flexibility in the positioning of the oil tank. Type: Four cylinder in line four stroke water cooled. Cylinders: Bore 2.5" (63.5mm), Stroke - 3.64" (92.5mm). Capacity 71.55 cub. ins. (1,172cc) Monobloc casting with detachable head and "Electron" cover plates. Crankshaft: Four throw carried on three main bearings, with a thrust ball race fitted behind the propeller mounting flange. Valve gear: Standard Ford side-valve gear. Lubrication: Full pressure feed by submerged gear pump to crankshaft main bearings and connecting rod bearings. Gudgeon pins and cylinder walls splash lubricated. Oil capacity of sump four pints. Carburation: Up draught carburettor, Zenith type 24U, fuel supplied by one AC mechanical diaphragm fuel pump operated by the camshaft. Cooling: Water circulation by pump with separate header tank and radiator. Weight: Dry no water or oil 145 lbs. Petrol consumption: 0.53 - 0.54 pints per h.p. hour. Performance: Normal output 32 h.p. @ 3,300 r.p.m. Maximum output 33 h.p. @ 3,500 r.p.m. I am interested in low horsepower pre-war aero engines, as I find them fascinating in their own right. 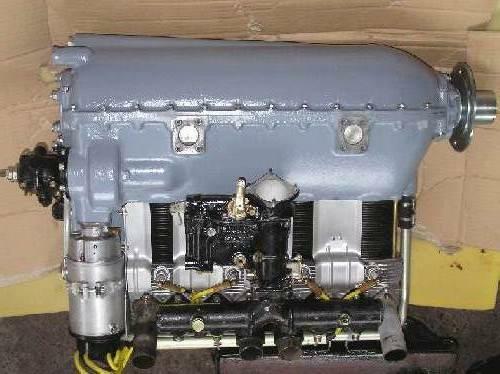 I am looking for any low horsepower engines such as Pobjoy, Salmson, Anzani, JAP, ABC Scorpion, Scott, Bristol Cherub or similar types. So should you know of any I would be very interested to hear about them, thanks - Roy Nerou. The re-emergence of interest in the Chilton Monoplane has coincided with the availability of the 65 H.P. Mikron III engine. This is a particularly suitable engine from all respects, not least that of maintaining the original nose profile. The original engine fitted to G-AFSV was the French built Train 4T of 40 H.P., this engine weighs 114 lbs. Due to the demise of the engine maker's during the war and in the quest for higher speed for racing, when FSV passed into private hands in 1956, the Train engine was removed and a Mikron II fitted. The original thrust line with the Train engine was 4.5 inches above the top longeron, however, the Mikron II was installed with a lower thrust line. 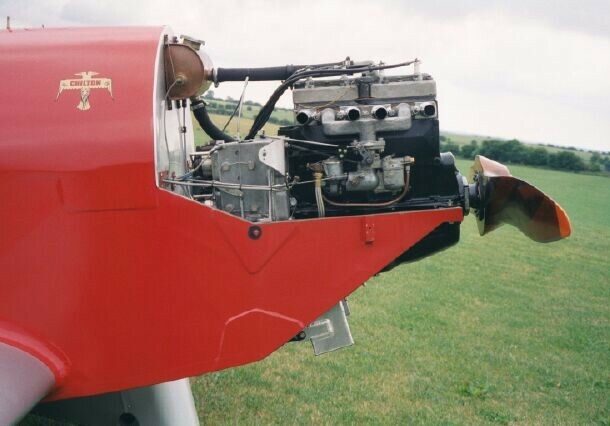 This is because the magnetos on the Mikron II are fitted on top of the crankcase, thus installation of the engine on the original thrust line would have resulted in the requirement for two unacceptably large and unsightly protrusions on top of the cowling. Even with the engine in the lower thrust line position, cowling modifications are required to accommodate the top portion of the magnetos. With the extra weight of the Mikron of about 25 lbs, over the original Train engine, one is aware of the importance of mounting the engine as rearward as possible. The Mikron III has its magnetos mounted vertically on the lower rear accessory casing, as did the Train engine. This firstly, enables the original thrust line to be maintained, secondly, because of the rearward slope of the firewall the higher engine position enables a further rearward movement of the engine. The Mikron III in its most advantageous position, gives a profile almost identical to that of the Train engined DW1A, the only difference would be a longer cowling. The higher fuel consumption associated with a more powerful engine may require extra fuel capacity. In the suggested configuration the size of the main fuel tank can be maintained, as the reduction in the available space behind the front bulkhead stops short of the tank position. In addition to the 10 gallons of fuel carried in the main tank the inclusion of the optional long range tank that is situated behind the pilot, (as fitted in 'FGI), would give another 4.6 gallons of fuel. The Mikron II like the Train, does not have a scavenge pump, so the oil tank must be mounted below the engine, however the Mikron III has a scavenge pump so this gives more flexibility to the position of the oil tank.